Last Thursday we hosted our regular quarterly Union Network* meeting at Arup which was particularly interesting and fun so wanted to share what happened and what we learned through this post. The event was co-curated by Duncan Wilson from Arup (See his post about the event here) and Andrew Sleigh who is an associate at 100%Open and currently working with us on our Home of the Future project with E.ON. The following post are Andrews reflections from the event originally posted at his personal blog here. On Thursday night, we gathered at Arup’s offices in London for an evening of inspiration and networking to hear 18 lightning pitches from grassroots groups, startups, designers and technologists, SMEs and corporates. If you can imagine Ignite, Maker Faire and TED all rolled into one, you’d have a pretty good impression of the evening. I can’t cover everything that was shared, but a number of themes emerged which I found interesting. Mark Hatch, CEO of TechShop told us of their remarkable success in enabling innovation and enterprise in the US, by providing access to tools and a community of fellow makers. Everything from the world’s first self-balancing bar stool, to the DODOcase (Obama’s favoured iPad case, it seems). The sheer volume of startups that had emerged from TechShop’s workshops was astounding. 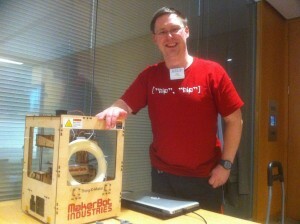 We don’t have any TechShops (yet) in the UK, but we do have a wealth of hackspaces. One of the most pioneering is the London Hackspace Andy ‘Bob’ Brockhurst came along to talk about some of the projects that have found a home there. Spend an evening at LHS and you can have a DNA-sequenced curry from Brick Lane, and then try and sneak your washing up past the Kinect-controlled kitchen-sink plate-pile detector. Every town should have a hackspace, fablab or TechShop – and they are springing up everywhere – but in some ways I’m more interested in how other work or play spaces might take on some of the functions and capabilities of a workshop. For example, schools are increasingly equipped with such machines, how about opening them up for experimentation beyond the confines of the school day and the school curriculum? 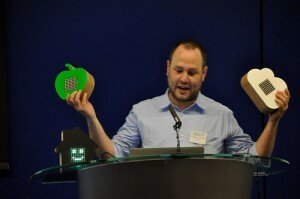 I’m reminded of Phillip Torrone’s proposal to turn public libraries into hackspaces. Xavier De Kestelier of Foster + Partners, shared his side-project, Smartgeometry, an online community of architects and designers, from practice, research and academia, that meets up once a year for a creative hothouse that pushes disciplines together for 5 days of intensive hacking and learning. I was particularly struck by the photos he showed of the workshop, where people were using computers and fabrication machinery in the same space. I for one, would love to work in a space like this. Low cost micro-controllers like Arduino, wireless networking communication like RFID, and ‘well-hooked’ web services like Pachube or even Twitter are spurring a revolution in the design of physical objects and digital services. The two worlds are being brought together into an “internet of things”. Whilst that term can have many meanings, one facet is that of physical objects that are networked, and can share information about their status, sensors, etc. For designers used to working with dumb lumps of matter, networked objects give them the opportunity to introduce intelligence (of a sort) and interactivity. For screen-based developers, the lure of tangibility is hard to resist. Gonzalo Garcia-Perate, a PhD researcher at Arup Foresight, talked about Hintsights, a cloud service and table-top device that lets users access data streams in a domestic setting away from the computer screen. Project like this are endlessly fascinating to geeks (including me) but in a way I’m more excited by their domesticity than their hackability. Berg’s Little Printer hooks into a similar insight – the appetite for a friendly, physical, off-screen interface to networked data. Greg Saul, from Diatom, showed off their Sketchchair project, which also has a digital and a physical component. Simple human-centred software for designing and manufacturing chairs, and remote, personalised fabrication. It’s clever in how it uses constraints to enable simplicity. The software is specialised to the task of designing a chair, complete with physics models and pose-able sitters. But doesn’t come laden with unnecessary features of a generalised 3D program. And the output is specific to the fabrication process, which uses a CNC machine to cut out planes of the charier, which can be shipped back to you and assembled into a finished chair. 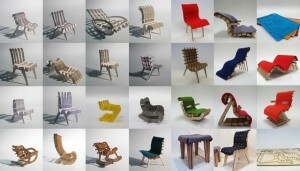 Sketchchair was one of several projects that had received a kick start from Kickstarter, the crowd-funding platform. One of the others was Cesar Harada’s Protei project, an open source sailing drone that makes use of a flexible hull design to enable the vessel to carry heavy loads through the water, powered by wind. They hope this technology could change the way oil spills and other ocean waste is cleaned up. Protei is built on open-hardware principles, and Cesar was quick to show how the network of interested hackers had improved their design and provided a community of support to help them gain backing and sustain the project. One of the projects Bob Brockhurst talked about was Nanode, an open source derivation of the Arduino prototyping platform with built-in network connectivity. Started at LHS, they’ve now spun it out into a separate company. Again, an enterprise enabled by both open-source hardware and a community hackspace. There is much more to be said on the subject, but these factors: crowd-funding, open source hardware, communities of hackers are, it seems, key of the foundations for innovation in hardware, particularly for hackers wanting to move into business. 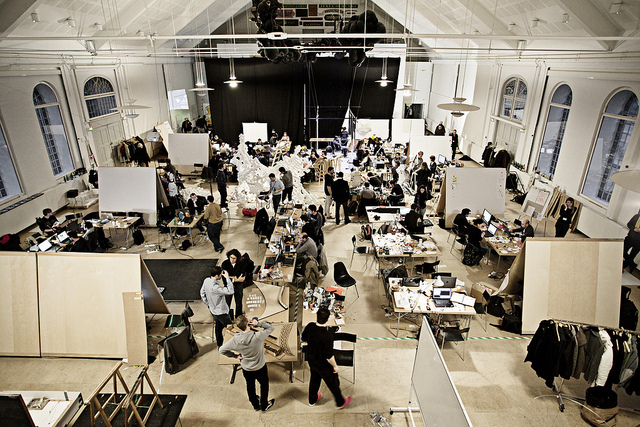 How do you apply the creative forces behind the maker movement at scale? Leo Poll of Philips Innovation Services, saw the potential of hacking for innovation when he came to the UK from the Netherlands (a country apparently constrained by regulations that hinder user-makers, and their ability to innovate, post-design). He made a call out for collaboration with grassroots makers within the enterprise. And talking to some of the corporates there, like Fujitsu and Arup, it was clear that many larger enterprises are still working out how to incorporate hacking into their practice; how to bring back physical craft into design processes dominated by digital tools, how to hook up communities of external, non-corporate problem solvers with internal business units unused to looking outwards for help. *The Union is an exclusive network of senior innovation professionals from primarily large organisations and from across all sectors. It is an informal network that was originally conceived in 2008 by Oracle and 100%Open and meet quarterly as a forum to share needs or innovation opportunities. Great review Andrew. I am now doubly sorry to have missed it! I like the challenge in your question “How do you apply the creative forces behind the maker movement at scale?” too. Maybe the reason this isn’t already happening is that User Makers are independent and with creative freedom not constrained by things like cost engineering. Maybe this will scale though, on a many-to-many basis that could be highly disruptive. absolutely – one of the dynamics is the freedom that an amateur has vs. the constraints of commercial engineering. And external innovators don’t have to be subjected to the pressures of the entire product development process. Could large-scale problems be broken up into chunks that are more approachable to independent makers? Two approaches to closing the divide. I’m sure there are many more. Is there a precedent in the creative industries? Moving from individual pieces to mass production of prints, cars etc? Is the issue about managing ownership and ensuring that creators retain IP and some control/input into future development. 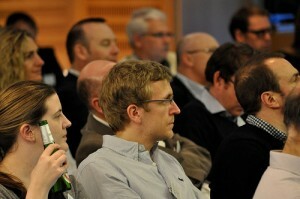 Would an IP workshop space help people? Perhaps with some pro bono or free at source pay from future earning related advice? I think there are parallels with amateur makers becoming cottage industrialists. Nanode being an example perhaps. You can also see the same sort of effect on sites like Shapeways, where designers sell individual copies of items, but can sometimes reach quite a high volume of sales. And developing literacy and confidence about IP are certainly important. There’s a massive gap there. Also awareness of how corporates work (accepting their diversity of course). 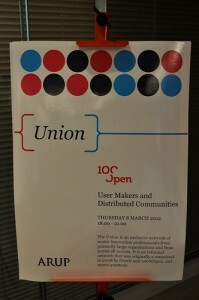 Both those things come partly from opportunities just to meet and talk, like this Union event.